Ricoh India has launched its new hybrid MFP Model MP305+SP, a smart A4 monochrome device with A3 capability. This printer is dubbed intelligent and super compact and comes with innovative features and improved operational efficiency. Its compact design enables it to be installed anywhere including office desks and counter tops. It has noise reduction and heat exhaust features which results in near silent operation Its carefully designed narrow bypass tray, rounded edges, ergonomic handles, and covered interface ports make it ideal for small and medium- sized offices. This device comes with advanced controller that provides a host of features like easy driver installation, enhanced scan to URL, Quick authentication, customizable user & device usage management and many more workflow enhancements. The device comes with a second-generation 10.1 inch Smart Android Operation Panel powered by Intel Processors and intuitive user interface which boosts productivity. The built-in Quick UI apps help users to carry out tasks seamlessly. This is productive printer which prints first page in 4.9 seconds and running at 30 ppm, it can complete a typical 5 page job in just 15 seconds. The “Quite Mode” allows users to print with reduced noise by adjusting the speed to 15ppm. “The new launch is in line with the company’s commitment in unveiling products, which are secure, productive and energy saver. Ricoh MP305+SPalso offer great flexibility by facilitating administrators to switch off the device even from a remote location. 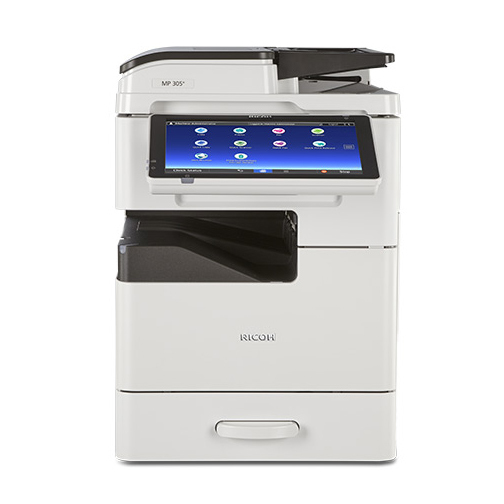 With this launch, Ricoh India adds the most inventive product to its MFP product portfolio.” added AT Rajan. The Ricoh MP305+SP is available at MRP of Rs. 172,830/- across India.